For this project we were split into groups of three and given a large sheet of paper. Each group had to use the sheet of paper to interact with as many different members the public as they could, however we could only use a black marker and a pair of scissors to ‘decorate’ the paper. Our group decided to cut the sheet of paper into lots of thin strips, we then wrote the words “finish line’’ on them and the idea was to hold these in public places for people to run through as if they were finishing a race. 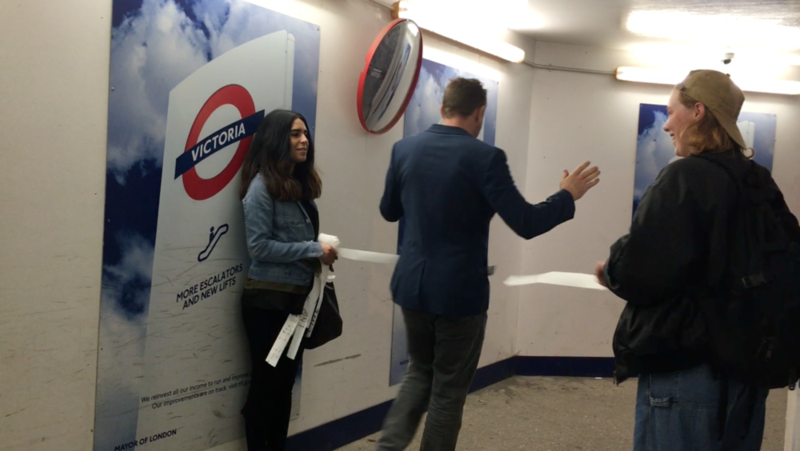 We thought it would be quick and fun way to engage people with the sheet of paper. 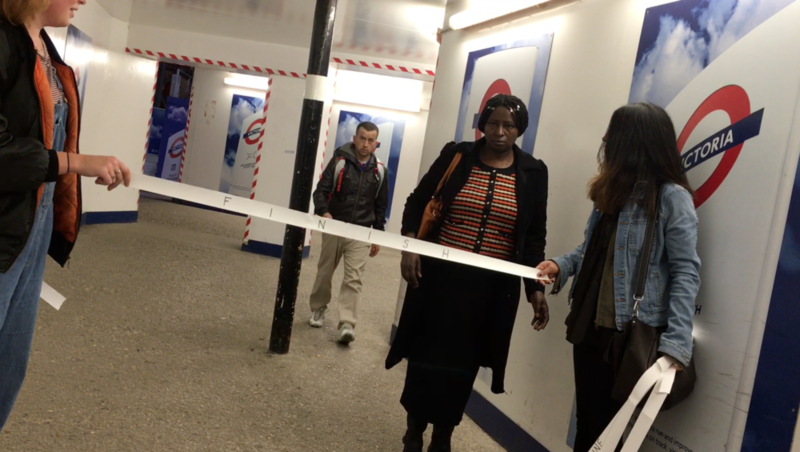 We went to London’s Victoria Station with our pre-prepared finish line strips and held them up in various places throughout the station for people to run through. At the start not many people walked through the finish line, as they were afraid of standing out, and breaking the strip. we had cut around 30 different finish lines, so as soon as someone walked through one we could instantly change for a new one. Eventually we positioned ourselves in a narrow tunnel that meant commuters had to walk through our finish line to get to the trains. Here we started to get some fun and interesting interactions, some people were clapping, waving and cheering as they walked through, while others were trying to get through it quickly or duck underneath it. Some people were confused and just stood there. It made a lot of people happy, and even the people who looked grumpy walking through it smiled a little afterwards. On reflection, I think it was fun a social experiment as crossing the finish line is generally seen as a positive thing so most people enjoyed crossing it. The idea of bringing joy to people through this creative experiment was a good feeling. During the project we had to count the interactions and including all of the people who moved out of their way to avoid us, we had over 400 interactions. Overall I think the project was fairly successful and fun to carry out, but if we were to repeat it, we would spend time beforehand finding a good location as this made all the difference. We could also have written more interesting sentences or words on the finish line to encourage people to cross it. Throughout the project I learnt a lot about social interaction with the public, as people were generally happy to be involved and it was fun engaging with them. In the future it would be fun to do other social interaction projects.